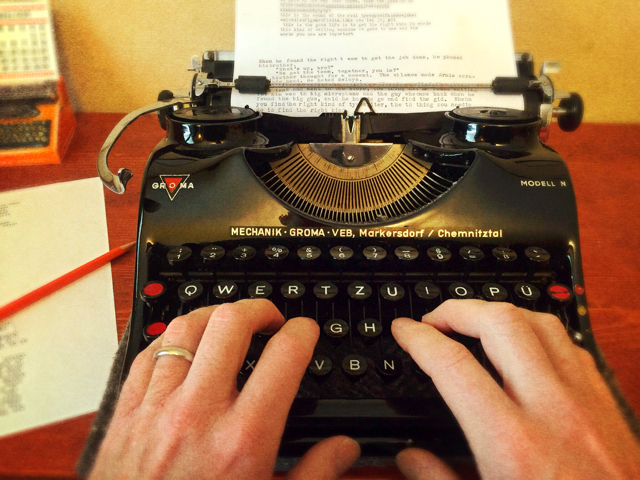 Poet's Notes: I recently acquired a typewriter. This is like achieving some sort of hipster merit badge. I enjoy postcards as I enjoy postal correspondence as I enjoy time travel. The addition of a newfangled outdated typing tool has enlivened my already lively love of postal correspondence, at least to the degree of postcards. I have sent poetry postcards to Canada, England, Germany, Venezuela - drop me a line and I'll send one to you, wherever you are. This poem is attached to a postcard I created, where the words in the title appear on the front, where the "wish you were here" picture customarily goes. I try to make some relationship between the postcard, whatever the picture, and the poem, which is both an engaging challenge and sometimes makes for unusual poems. You are forewarned.